1. 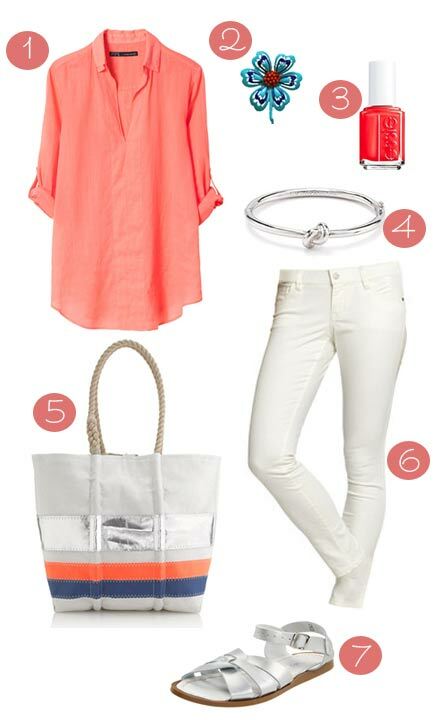 Bright v-neck blouse from Zara; 2. Colorful vintage brooch from etsy. I’m into incorporating vintage brooches into outfits since my Brimfield finds over the weekend; 3. A nice bright orange/red nail – Hip-Anema from essie; 4. Sailors Knot Hinge Bangle from kate spade because I always equate nautical things with summer; 5. The colors and metallic stripe of this J. Crew Sea Bags medium tote just screams summer to me; 6. White Rockstar Super Skinny jeans from Old Navy because I personally cannot spend a lot on anything white because it gets dingy and/or stained so easily; and 7. Silver Saltwater Sandals for comfort while walking around all weekend.